Kate Devine, Erasmus student at the University of Turin, looks into the recent resurgence of feminism in Italy, and asks what has brought tens of thousands into the streets. On 11 February 2011 hundreds of thousands of women piled into the streets of Italian cities and towns to shout “Se non ora, quando?” (“If not now, when?”). For decades Italy has lagged behind the rest of Europe and much of the wider world when it comes to gender equality. On International Women’s Day, 8 March, Workers’ Liberty women in London helped organise a meeting to celebrate the original, militant tradition of the day. What tradition? International Women’s Day — founded in 1911 as International Working Women’s Day — was first proposed by Clara Zetkin and other socialist women. It was a response to the 1907/8 demonstrations of women workers in New York demanding shorter hours, better pay, union rights and the vote, and to the “Rising of the 20,000”, a 13-week strike of women garment makers in 1909. The latest US craze to hit the UK is for religious nutcases to gather outside abortion clinics hassling staff and patients. In Brighton “pro lifers” gather twice weekly to harangue and intimidate women trying to access services they are legally entitled to. In Bloomsbury daily “prayer vigils” are being held outside the British Pregnancy Advisory Service (BPAS) throughout Lent. The Women’s Conference of the National Union of Students (13-15 March) gave the left many reasons to look forward to the year ahead. Kelley Temple, backed by the National Campaign Against Fees and Cuts (NCAFC) Women, was elected Women’s Officer. Conference passed progressive policy. Imogen Martin from Hull is the new Black Students Rep and Emma Kerry from Leeds is on as a job share Disabled Rep.
London Metropolitan University has decided to ditch the the Women’s Library and Trades Union Congress Library Collections — they are seeking “new homes” for the books, pamphlets and other materials. These are incredibly important collections, not stray dogs, and should be defended. Workers at both libraries were not involved in these decisions. 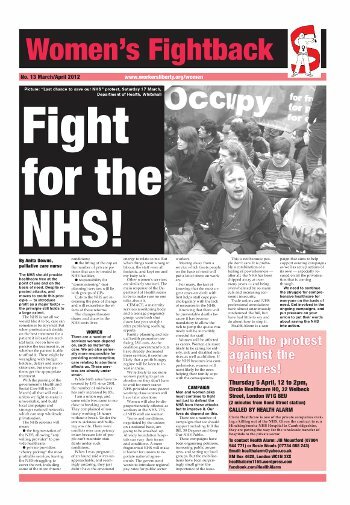 The NHS should provide healthcare free at the point of use and on the basis of need. Despite repeated attacks, and moves to erode this principle — to introduce profit as a major factor — the principle still holds to a large extent.